The disproportionation reaction is extensively used in chemistry and often has great preparative significance. The purpose of this research was to find a way to stop this disproportionation reaction from occurring without altering the catalytic properties of the compound and its derivatives. 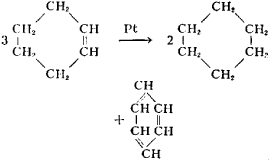 6) some of the peroxide is consumed in the disproportionation reaction to produce oxygen and water. t]" the rate constant for the disproportionation reaction. However, as the instantaneous concentration in RO [dot] in the system was low, the disproportionation reaction between two RM [dot] radicals (pathway B in Fig. The disproportionation reactions are generally much faster than the other reactions, leading rapidly to a state of quasi-equilibrium with respect to the concentration of linear dextrins that will be cyclized by the enzyme. The grafted chains are terminated by coupling or disproportionation reactions (26).